My food schedule is a little different on weekdays than weekend days, so I want to give you a little peek in both! Please be aware that this is an example and don’t copy and paste my food behavior. This works for me, but please listen to your own beautiful body to figure out what makes you healthy and happy. Rise and shine! I always do my workouts in the morning, so I always eat something small that’s a perfect pre-workout boosterm too 😉 I had a banana and a vegan protein shake made of 200 ml almond milk and 25 grams pea protein powder. Yes, early morning workouts actually mean you can have two breakfasts lol! HIIT makes me crazy hungry so a filling breakfast is very welcome. I went for overnight oats with 45 grams oats, 1 tablespoon chia seeds, 50 grams blueberries and a big hand of crumbled walnuts. On workdays I always look forward to lunchtime to give my mind a little break and enjoy a good meal for new energy. I’m not the biggest fan of bread for lunch, so most of the time you’ll find me with meal prep combo’s in my Tupperware! Today I had 1 whole wheat wrap, 1/2 tbsp hummus, spinach, 100 grams of falafel balls and 150 gr veggies on top. A simple but healthy and filling snack: 2 boiled eggs. Not boiled too long, so they keep that soft taste but not having the yolk dripping – yummy! Add a little pepper and your good to go till dinner. I always boil a few eggs at once, so I can always grab some from the fridge for a quick snack. Boiled eggs stay good in the fridge for about a week. For dinner I kept it quite simple: mixed 100 grams grilled tofu, 75 grams quinoa, veggies (carrot, red onion, zucchini, mushrooms, eggplant and broccoli) with 1/2 tbsp olive oil for dressing. I like to bring the mixed veggies to taste with some turmeric, paprika powder and black pepper. Oh and! I always make double veggie portions, so I can easily consume my veggies the day after with lunch. I al-ways have an evening snack, because I simply can not stay away from food too long haha. Today I had a 3 pieces of 75% dark chocolate! I usually don’t sleep in late (always too excited to get my day started! ), but I do like to take it easy in the weekends! First I always start the day off with a glass of water, and no, not because of a hangover 😉 I enjoy to take my time for something special from the oven to have for breakfast. This morning I made pumpkin-apple crumble with low-fat quark for extra protein. Find the recipe here + add pumpkin. Late lunch. I love eggs in every kind of way, so for lunch I made an omelet with 3 eggs (1 egg white), a bit of almond milk, turmeric, black pepper, some mushrooms and cherry tomatoes. I enjoyed this on 3 slices of sourdough spelt bread, toasted plus 1/3 mashed avocado. For my 4 o’clock snacky time I had a large bowl of mixed raw veggies (carrot, celery, bell pepper) dipped in hummus. Are you as much of a hummus fan as me?! This works so good for your afternoon hearty appetite, or for example to enjoy while watching a movie rather than chips or popcorn. In the weekend I usually go for something out of the oven for dinner! I made a portion of 200 grams sweet potato fries, together with 125 grams steamed salmon and 250 grams fennel with some grated goat cheese. I hope you can use my Foodie-ness food diary as inspiration to create your own healthy food schedule. 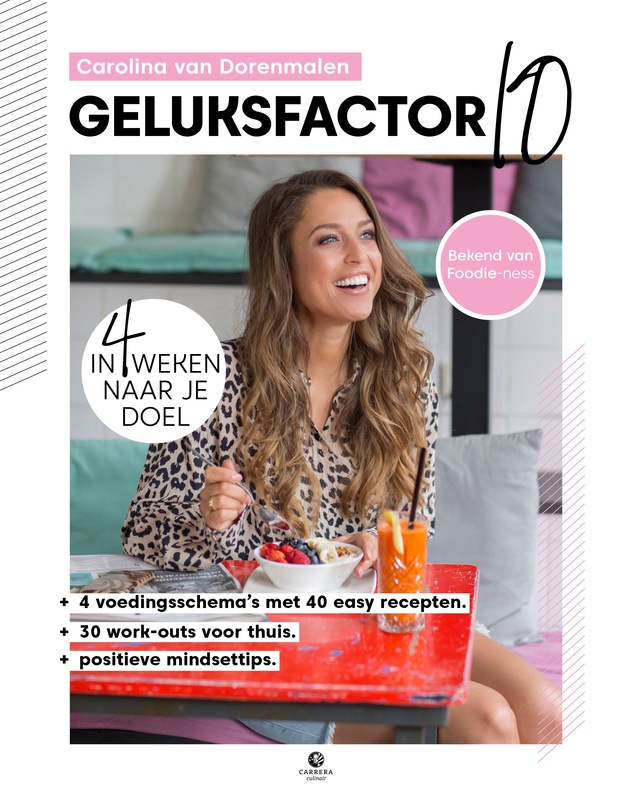 I get lots of questions about what to do after following my 4-week Geluksfactor 10 book or Personal Coaching program? You don’t always need a strict schedule, but do try to plan in advance. Find out what works for you with portions size and ingredients. As you can see I variate a lot too, and remember that it’s all about balance girls! Extra: read here how to easily recover from cheat days/ cheat meals!